Could you use an extra $50 to spend at Macy’s?? Most of us could! For a limited time, enter to win a Macy’s Gift Card HERE! Thursday, January 26th at 12:00 AM ET to Sunday, January 29th at 11:59 PM ET. 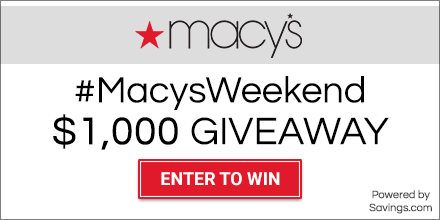 Users enter the giveaway by heading to the Macy’s page on Savings.com and submitting their email address on the form at the top of the page. The winners will be chosen through a lottery drawing and notified on Tuesday (1/31) via the email address they used to enter. Check out all these amazing sales happening right now! Plus use the Coupon Code: WKND for an additional 20% OFF for an even deeper savings!